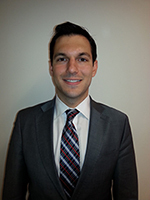 Steven Interrante is an Associate in the firm’s Real Estate Group. He represents clients in a variety of real estate transactions, including acquisitions, dispositions, financing, leasing and joint venture negotiations involving, apartment buildings, affordable deals, office buildings, mixed-used properties, as well as residential transactions involving condominiums, cooperatives and townhouses. Mr. Interrante has represented both borrowers and lenders in securitized loans, as well as secured and unsecured credit facilities. He has also represented owners in connection with construction and architect contracts. Prior to joining the firm, Mr. Interrante was an associate at Goldstein Hall PLLC where he represented affordable housing developers, lenders and buyers and sellers. He began his career as an associate with Kossoff PLLC.